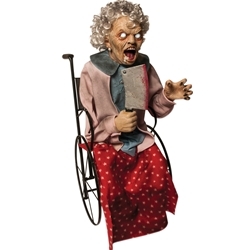 This animated wheelchair granny Halloween decoration creates the effects of a creepy and spooky old lady who is wheelchair bound. The animated wheelchair granny decoration features a sitting animated old lady that rises up and down, with light-up eyes, and multiple audio tracks. The wheelchair functions but is limited in distance it can be rolled as the prop is powered using a standard 110w household outlet. Decoration measures 4’ tall. Please note: these requires special shipping and additional shipping fees will apply. Please contact us toll free at 877-218-1289 for a shipping price.